For the mushroom formerly known as Ramaria aquafaba, see Ramaria flavosaponaria. Meringue kisses made from aquafaba. Aquafaba (/ˌɑːkwəˈfɑːbə/) is the viscous water in which legume seeds such as chickpeas have been cooked. 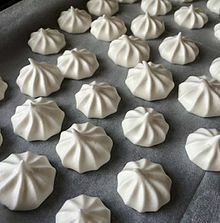 Due to its ability to mimic functional properties of egg whites in cooking, aquafaba can be used as a direct replacement for them in some cases, including meringues and marshmallows. Its composition makes it especially suitable for use by people with dietary, ethical, environmental or religious reasons to avoid eggs, such as vegans. The general recommendation for use is to replace one medium egg white with 30 millilitres (2 tablespoons) of aquafaba in a recipe, or to replace one medium whole egg with 45 ml (3 tbsp). The simplest way to use it is to decant the liquid from canned or boxed legumes such as white beans or chickpeas. Alternatively, it can be made by boiling, steaming, pressure cooking, or microwaving pulses in water until they are cooked. Sweet applications where a direct substitution for egg whites has been found to be successful include meringues, macarons, nougat, icing, ice cream, fudge, and marshmallows. Examples of other savory and other egg replacement applications include: baked goods, dairy substitutes, mayonnaise, cheese substitutes, batters, cocktails, and meat substitutes. Aquafaba has about one tenth of the protein that egg whites have for a given weight. The difference in protein content may enable a way for people who cannot properly metabolize proteins (e.g., PKU) to enjoy egg-based foods. However, the lower amount of protein also means that using it as a substitute for egg whites in food applications which rely heavily on egg protein for structure, such as angel food cakes, is not recommended. The best aquafaba seems to be from chickpeas and white beans like great northern beans. Other legumes such as peas, soy beans, lentils, kidney, and black beans can also be used to some degree but have slightly different compositions than the chickpea and white bean aquafaba and may require more tinkering with the concentration to work well. In December 2014, vegan French musician, Joël Roessel, discovered that water from canned beans and other vegetables can be made to form foams much like protein isolates and flax mucilage. Roessel shared his experiments on a blog in France showing that the canning liquid can be used as a foaming agent. He also published recipes for floating island of Chaville, chocolate mousse, and a meringue made from chickpea liquid, sugar, corn starch and guar gum to demonstrate its foaming capabilities. Around the same time, others in France began to experiment with using chickpea foam in desserts, which caught the attention of software engineer and vegan food enthusiast Goose Wohlt, in the United States. Wohlt discovered that the cooking liquid can be made and used in such a way as to completely replace egg white on its own without the need for stabilizers. He disclosed this to a popular vegan Facebook group in March 2015 by way of a recipe for an egg-free meringue using only two ingredients: chickpea cooking liquid and sugar. A few days later, a new group was created on Facebook to encourage development, support even more discoveries, and popularize the new egg white substitute. Legume seeds, or pulses, are primarily composed of carbohydrates (starch, sugars, and fiber), proteins (albumins and globulins), and water. The carbohydrate component is significantly higher than the protein portion, and the starch portion of legumes is mostly amylose and amylopectin. A typical nutritional composition of chickpeas, for example, is listed as 19% protein, 61% carbohydrate, 6% lipids, and 14% water. However, these amounts are approximate and can vary by variety. During the process of cooking legume seeds, the starches in the seed are gelatinized, setting up conditions which allow for soluble parts of the seed to disperse back out into the cooking water. The hotter the temperature, the higher the pressure, and the longer the seeds cook, the more material is transferred out of the seed into the solution. Once the legumes are cooked and filtered out, the water-soluble fraction that is left is aquafaba. Comparing the final composition of a cooked seed with a raw seed shows that under normal cooking conditions, approximately 5% of the initial dry weight has been transferred to the cooking water. The dry matter consisted mainly of carbohydrates (sugars, soluble and insoluble fibre) and protein. That ratio of soluble material is approximately the same ratio as found in the raw seed, However, fat and starch were not detected. A concentration of 5% dry weight to water is typical for aquafaba, but the solution can also be reduced to increase the concentration to 10% or more, depending on the application. This can be especially useful for applications where emulsification and viscosity are more important than foaming capabilities. The concentration can also be tailored to produce a more stable foam using less aquafaba by carefully filtering non-soluble material from the solution and adjusting the concentration to the application. The first peer-reviewed publication using the term "aquafaba" was recently published by Martin Reaney's group at the University of Saskatchewan (Canada). In this research, they have found that chickpea aquafaba from different commercial sources produces foams that vary in both properties (volume and stability of foam) and chemical composition. 1H-NMR was used to analyze the composition of aquafaba. NMR analysis revealed that the foam contained mainly polysaccharides, sucrose and protein. Protein separations by membrane filtration followed by SDS-PAGE and peptide mass fingerprinting were used to identified aquafaba proteins contributing to foaming properties. Reaney's group research showed that most of aquafaba proteins belonged to known heat soluble proteins such as late embryogenesis abundant proteins and dehydrins. Identified proteins also included heat shock protein, defensin, histone, nonspecific lipid transfer protein and superoxide dismutase. Major storage proteins provicillin and leguminin were also present. In 2015, it was theorized that the most likely agent that caused the liquid to foam was saponins. However, the group's research has shown that aquafaba foaming property is a result of the presence of saponins, carbohydrates and protein fractions. In general, the composition of aquafaba depend on: 1. processing methods (soaking, cooking and industrial dehydration), 2. conditions (pH, temperature, pressure and treatment duration), 3. genotype (Kabuli or Desi chickpeas), 4. additives, 5. protein concentration, and 6. carbohydrate type and concentration. The word aquafaba was coined on March 13, 2015, by Goose Wohlt in order to provide the community with a common name for the cooking liquid. It is a concatenation of the Latin word for water, aqua, and the Latin word for bean, faba. It was also intended to suggest both a reference to the entire fabaceae legume family from which aquafaba is made as well as the notion that the discovery was also "faba"-lous. After significant international adoption, the word was officially submitted to the Oxford English Dictionary on its first anniversary. ^ Wohlt, Goose. "The Official Aquafaba Site". www.aquafaba.com. Retrieved March 22, 2016. ^ a b c Wohlt, Goose. "Aquafaba FAQ". www.aquafaba.com. Retrieved March 22, 2016. ^ "The Best Vegan Egg Substitute For Baking". The Huffington Post. October 2015. Retrieved March 23, 2016. ^ lindajulien (May 8, 2015). "Egg-Free, Dairy-Free, Vegan Italian Meringue Buttercream". Geeky Cakes. Retrieved March 22, 2016. ^ "Vegan S'mores". olivesfordinner.com. Retrieved March 22, 2016. ^ Valle, Mary (September 29, 2015). "'Aquafaba': chickpea brine is a surprisingly egg-cellent baking substitute". The Guardian. ISSN 0261-3077. Retrieved March 23, 2016. ^ "13 Amazing things you can do with aquafaba". The Vegan Society. Retrieved March 22, 2016. ^ "16 Unbelievable Vegan Recipes You Can Make With Canned Bean Juice (Aquafaba)". PETA. Retrieved March 22, 2016. ^ "Nina's Game Changing Vegan Butter w Aquafaba". PlantePusherne. July 18, 2015. Retrieved March 22, 2016. ^ "How to Use Aquafaba (AKA Chickpea Brine) for Vegan "Egg White" Cocktails". Tales of the Cocktail. December 17, 2015. Retrieved March 22, 2016. ^ Wohlt, Goose. "Aquafaba Nutrition". www.aquafaba.com. Retrieved March 22, 2016. ^ "La mousse végétale". Révolution végétale. December 4, 2014. Archived from the original on March 15, 2016. Retrieved March 22, 2016. ^ "Mousses – Isolats de protéines". Révolution végétale. December 7, 2014. Archived from the original on February 27, 2015. Retrieved March 22, 2016. ^ "Mousses – Mucilages". Révolution végétale. December 7, 2014. Archived from the original on June 25, 2015. Retrieved March 22, 2016. ^ a b Shim, Youn Young; Mustafa, Rana; Shen, Jianheng; Ratanapariyanuch, Kornsulee; Reaney, Martin J. T. (2018). "Composition and Properties of Aquafaba: Water Recovered from Commercially Canned Chickpeas". Journal of Visualized Experiments (132): e56305. doi:10.3791/56305. PMC 5912395. PMID 29553544. ^ "Île flottante végétalienne". Révolution végétale. December 7, 2014. Archived from the original on June 24, 2015. Retrieved March 22, 2016. ^ "Mousse au chocolat". Révolution végétale. December 9, 2014. Archived from the original on April 4, 2015. Retrieved March 22, 2016. ^ "Meringue végétalienne - Révolution végétale". December 4, 2014. Archived from the original on March 28, 2015. Retrieved March 22, 2016. ^ wohlt, goose. "Aquafaba History". www.aquafaba.com. Retrieved March 22, 2016. ^ "One solution for all egg-free baking needs". philly-archives. Retrieved March 23, 2016. ^ a b Rachwa-Rosiak, Danuta; Nebesny, Ewa; Budryn, Grażyna (January 1, 2015). "Chickpeas—composition, nutritional value, health benefits, application to bread and snacks: a review". Critical Reviews in Food Science and Nutrition. 55 (8): 1137–1145. doi:10.1080/10408398.2012.687418. ISSN 1549-7852. PMID 24915347. ^ "Nutrition Facts and Analysis for Chickpeas (garbanzo beans, bengal gram), mature seeds, raw". SELFNutritionData. Retrieved March 23, 2016. ^ Sayar, Sedat; Turhan, Mahir; Köksel, Hamit (December 1, 2003). "Application of unreacted-core model to in situ gelatinization of chickpea starch". Journal of Food Engineering. 60 (4): 349–356. doi:10.1016/S0260-8774(03)00057-8. ^ Alajaji, Saleh A.; El-Adawy, Tarek A. (2006). "Nutritional composition of chickpea (Cicer arietinum L.) as affected by microwave cooking and other traditional cooking methods" (PDF). Journal of Food Composition and Analysis. 19 (8): 806–812. doi:10.1016/j.jfca.2006.03.015. Archived from the original (PDF) on May 28, 2016. ^ Stantiall, S. E.; Dale, K. J.; Calizo, F. S.; Serventi, L. (2018). "Application of pulses cooking water as functional ingredients: the foaming and gelling abilities". European Food Research and Technology (244): 97–104. ^ "Aquafaba, what is its chemical composition?". www.friekaker.no. Retrieved March 23, 2016. ^ a b Youn Young Shim; Rana Mustafa; Jianheng Shen; Kornsulee Ratanapariyanuch; Martin J. T. Reaney (2018). "Composition and Properties of Aquafaba: Water Recovered from Commercially Canned Chickpeas". Journal of Visualized Experiments (132): e56305. doi:10.3791/56305. PMC 5912395. PMID 29553544. ^ "Dr. Reaney". teamphat.usask.ca. Retrieved February 16, 2018. ^ "Composition des liquides de trempage des végétaux". Révolution végétale. January 25, 2015. Retrieved February 8, 2016. ^ Hartke, Kristen (October 5, 2015). "Trust us. You can use the liquid from a can of beans to make dessert". The Washington Post. ISSN 0190-8286. Retrieved March 23, 2016. Look up aquafaba in Wiktionary, the free dictionary.